At the end of the eleventh century, Europeans began their first concerted attempt to expand beyond the frontiers of Europe by conquering the land of Palestine. 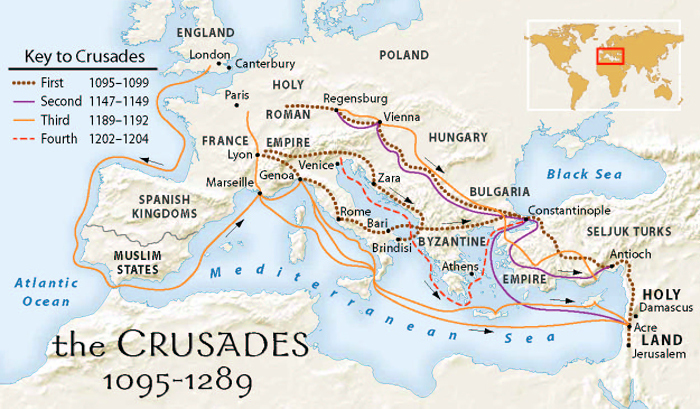 This ‘‘Peasant’s Crusade’’ or ‘‘Crusade of the Poor’’ consisted of a ragtag rabble that moved through the Balkans, terrorizing natives and looting for their food and supplies. Their misplaced religious enthusiasm led to another tragic by-product as well, the persecution of the Jews, long pictured by the church as the murderers of Christ. As a contemporary chronicler described it, ‘‘They persecuted the hated race of the Jews wherever they were found.’’ Two bands of peasant crusaders, led by Peter the Hermit, managed to reach Constantinople. The Byzantine emperor wisely shipped them over to Asia Minor, where the Turks massacred the undisciplined and poorly armed mob. Pope Urban II did not share the wishful thinking of the peasant crusaders but was more inclined to trust knights who had been well trained in the art of war. Three organized crusading bands of noble warriors, most of them French, made their way eastward. The crusading army probably numbered several thousand cavalry and as many as ten thousand infantry. 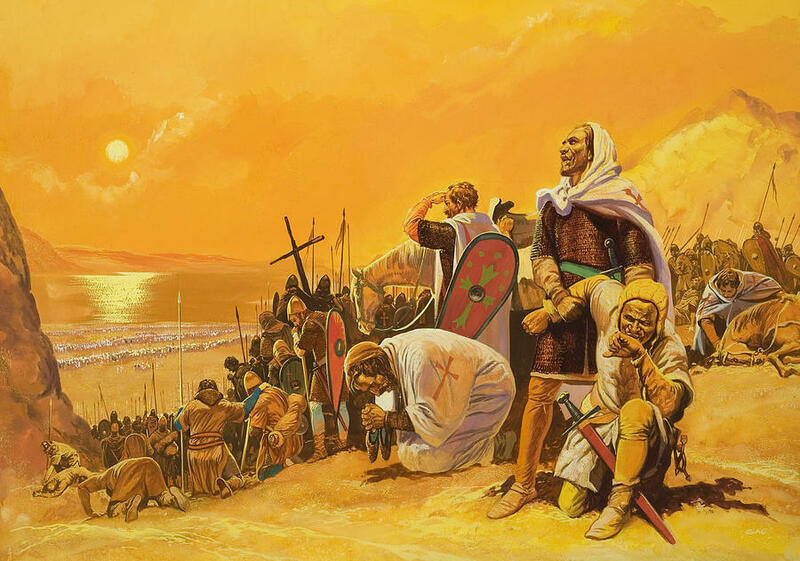 After the capture of Antioch in 1098, much of the crusading host proceeded down the Palestinian coast, evading the well-defended coastal cities, and reached Jerusalem in June 1099. After a five-week siege, the Holy City was taken amid a horrible massacre of the inhabitants—men, women, and children. After further conquest of Palestinian lands, the crusaders ignored the wishes of the Byzantine emperor and organized four Latin crusader states. Because the crusader kingdoms were surrounded by Muslims hostile to them, they grew increasingly dependent on the Italian commercial cities for supplies from Europe. Some Italian cities, such as Genoa, Pisa, and especially Venice, grew rich and powerful in the process. But it was not easy for the crusader kingdoms to maintain themselves. Already by the 1120s, the Muslims had begun to strike back. The fall of one of the Latin kingdoms in 1144 led to renewed calls for another Crusade, especially from the monastic firebrand Saint Bernard of Clairvaux. He exclaimed, ‘‘Now, on account of our sins, the enemies of the cross have begun to show their faces. . . . What are you doing, you servants of the cross? Will you throw to the dogs that which is most holy? Will you cast pearls before swine?’’ Bernard even managed to enlist two powerful rulers, but their Second Crusade proved to be a total failure. The Third Crusade was a reaction to the fall of the Holy City of Jerusalem in 1187 to the Muslim forces under Saladin. Now all of Christendom was ablaze with calls for a new Crusade. Three major monarchs agreed to lead their forces in person: Emperor Frederick Barbarossa of Germany (1152–1190), Richard I the Lionhearted of England (1189–1199), and Philip II Augustus, king of France (1180–1223). Some of the crusaders finally arrived in the Holy Land by 1189 only to encounter problems. Frederick Barbarossa drowned while swimming in a local river, and his army quickly disintegrated. The English and French arrived by sea and met with success against the coastal cities, where they had the support of their fleets, but when they moved inland, they failed miserably. Eventually, after Philip went home, Richard the Lionhearted negotiated a settlement whereby Saladin agreed to allow Christian pilgrims free access to Jerusalem. After the death of Saladin in 1193, Pope Innocent III initiated the Fourth Crusade. On its way east, the crusading army became involved in a dispute over the succession to the Byzantine throne. The Venetian leaders of the Fourth Crusade saw an opportunity to neutralize their greatest commercial competitor, the Byzantine Empire. Diverted to Constantinople, the crusaders sacked the great capital city of Byzantium in 1204 and set up the new Latin Empire of Constantinople. Not until 1261 did a Byzantine army recapture Constantinople. In the meantime, additional Crusades were undertaken to reconquer the Holy Land. All of them were largely disasters, and by the end of the thirteenth century, the European military effort to capture Palestine was recognized as a complete failure. Whether the Crusades had much effect on European civilization is debatable. The crusaders made little long-term impact on the Middle East, where the only visible remnants of their conquests were their castles. There may have been some broadening of perspective that comes from the exchange between two cultures, but the interaction of Christian Europe with the Muslim world was actually both more intense and more meaningful in Spain and Sicily than in the Holy Land. Did the Crusades help stabilize European society by removing large numbers of young warriors who would have fought each other in Europe? Some historians think so and believe that Western monarchs established their control more easily as a result. There is no doubt that the Crusades did contribute to the economic growth of the Italian port cities, especially Genoa, Pisa, and Venice. But it is important to remember that the growing wealth and population of twelfth-century Europe had made the Crusades possible in the first place. The Crusades may have enhanced the revival of trade, but they certainly did not cause it. Even without the Crusades, Italian merchants would have pursued new trade contacts with the Eastern world. The Crusades prompted evil side effects that would haunt European society for generations. The first widespread attacks on the Jews began with the Crusades. As some Christians argued, to undertake holy wars against infidel Muslims while the ‘‘murderers of Christ’’ ran free at home was unthinkable. The massacre of Jews became a regular feature of medieval European life. The Roman Catholic Church shared in the challenge of new growth by reforming itself and striking out on a path toward greater papal power, both within the church hierarchy and over European society. The High Middle Ages witnessed a spiritual renewal that enhanced papal leadership and the religious lives of the clergy and the laity. At the same time, this spiritual renewal also gave rise to the crusading ‘‘holy warrior’’ who killed for God, thereby creating an animosity between Christians and Muslims that still has repercussions to this day. This entry was posted in Crusades, Medieval by MSW. Bookmark the permalink.